Sailors are only young once – for this sailor it’s once a year at Kiel Week. An old J-24, old sails and a 43 year old man felt young again from 22 to 25 June. Kiel is tremendous – 6,000 competitors and 2,000 boats, double the size of Cowes. We are sailing at the 1972 Olympic center on the northwest side of the bay. Kiel also hosted the 1936 Olypmics and is making an impressive bid to so again in 2012. Submarines and square riggers are out in numbers. A few kilometers away in the old Hanseatic city there is an enormous annual festival with some hundreds of thousands of people participating in a four kilometer party (www.kieler-woche.de), but I don’t have the time to visit given all the sailing and partying here, and this is my third Kiel Week in a row! The Kiel Week organisers seem obsessed with reminding you of the years they take away by posting the birth dates of all skippers and crews with each set of results. Looking back to 50-something Horst Rieckborn at the helm of his J-24, I remember that he is the oldest J-24 skipper, competing in his 25th Kiel Week. Axel is the 39 year old youngster hopping around the cockpit doing all the winching. Hans is my 49 year old buddy scrambling across the deck at each shout of “Wende!” (tack!) while Volker’s weight on the foredeck is another reminder of some of the disadvantages of age. Our boat is named Pathétique. I reckon that Horst added up the age of his crew and arrived at a number near the year when Beethoven composed his eponymous sonata. I’m told the name sounds better in German, but surely they’re referring to the music? My notional job is tactics and navigation up on the rail. Notionally, I speak a form of halting German that becomes abrupt, braking German when things get hectic. In all the confusion and fun, I manage to throw a few suggestions in and, as is usual with tacticians, remember making a massive contribution to successes and no contribution to failures. Off the course, the organisers and competitors couldn’t be more welcoming to non-German speakers. Everything is provided in English and German. While I enjoy the majesty of Brest, the warm welcome of Cork, the thrills of the Solent and the fun of local regattas, Kiel has become my annual highpoint. Three things stand out – keen competition, fantastic organisation and good value. 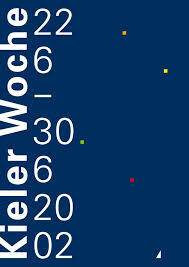 Starting with the keen competition, in truth, Kiel Week might be more accurately called the Two Kiel Half-weeks. 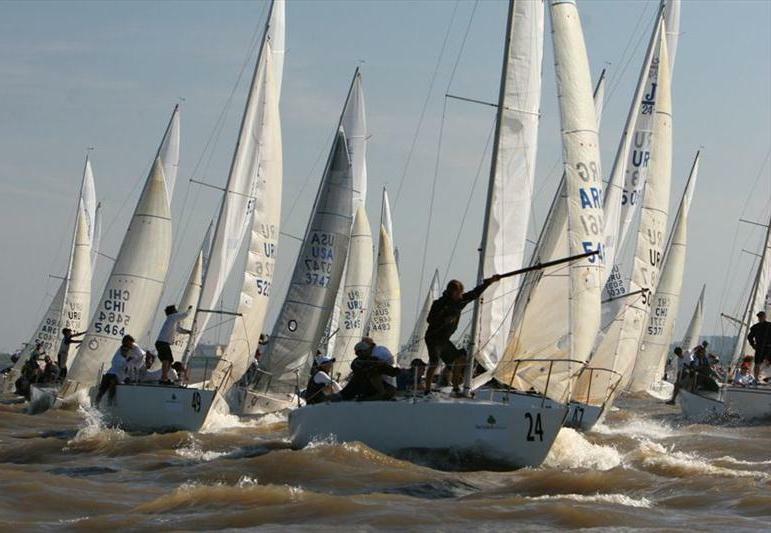 The first four day regatta comprises various international classes with 2 races on the first day, 3 on the second, 3 on the third and 1 race on the fourth. The second four day regatta comprises the Olympic classes. Throughout there are classic and offshore races. Professional committee boat starts in several separate areas are a far cry from the self-centredness of the RYS line at Cowes. The racing is very international. Most of our competitors are top sailors in their own countries. Sailors from over 70 countries are competing in various classes, for example the Chinese windsurfing team. This year our class of 36 J-24’s has Dutch and Swedish entries alongside the top German sailors. In previous years we’ve had US, French, Swiss, Italian and other nations. In the bars on Monday and Tuesday sailing gods such as Sailing Hall of Fame’s Mark Reynolds rub shoulders with mortals out for some good fun. The blend of competition and camaraderie leads to genuine convivialité or gemütlichkeit depending on your linguistic preference. For once a national stereotype has a very positive side – fantastic organisation. The support Kiel’s organisers provide to competitors makes you feel special. There is a detailed weather briefing each morning from a national TV weatherman, complete with handouts so you don’t need notes. The race results are efficient and timely. The cars to and from the car parks are frequent, with televisions so you don’t miss World Cup games, although because the television only operates when the car is stopped there tends to be a bit of stop-start braking of the shuttle cars in time with radio announcements of things worth watching. There is a wide, varied selection of food, from fast food of all sorts to restaurants. As the Rolling Stones prove, with enough drink, it’s never a drag getting old. While I know little about “mother’s little helper”, there is an even better selection of drink, drunk from glass not plastic. The varied evening entertainments are a wonderful combination of music and humour. One group, United Four, seems to have become an annual double fixture singing cover tunes with an enthusiasm that has an audience of several hundred chanting along till past midnight. Seeing their six and half foot lead singer do a very passable vocal and visual send-up of Britney Spears brings tears, of humour, to your eyes. Their self-deprecating humour makes you question other German stereotypes. To address good value, €180 provides all race fees for the 9 races, berthing, boat lifts, car parking, very frequent shuttles back to the car for forgotten possessions and hats for the crew. Contrast this with €260 or more for an equivalent Cowes entry for 7 races without berthing, lifts, parking, etc. Hotel accommodation less than five minutes walk from the boat set us back €50 per evening. Two beers, a steak, salad and chips in a nice restaurant set our budget back a chilling €18, and, no, we hadn’t made reservations a year in advance. True, you have to get to Kiel, but with discount flights to Hamburg, Bremen or Lűbeck often running at £120 or less it looks competitive with public transport to Cowes. Sure, there are some problems. Three Musto dealers were of no use on a problem with Musto’s HPX gear, although Musto UK sorted it out gratis. The committee boat tangled a start of one class with the finish of another, wasting an hour. The tideless Baltic will never match the complexity of the Solent. I think the final word on Kiel ought to go to old-timer Horst, who has seen the racing double in size over the last quarter of a century. Asked about his plans for his 26th year, Horst said, “I couldn’t miss the best competition in all of Europe”. So how did we do? Well to use an old Irish expression, it took a lot of people to beat us. We tried to help them by being too lazy to change up to the genoa when the breeze reduced in one race (age you know), or by diving overboard in disgust at having to take a 720 penalty (well, I may have not quite understood the German warning that the 720 was about to start). Despite our best efforts, we placed a credible 15th against the 35 other youngsters. More importantly, we placed our reservation for next year. Michael Mainelli has been racing traditional craft and plastic boats with equal enjoyment for over 30 years. He is a Royal Corinthian Yacht Club member and a committee member of the Thames Match. Michael has been racing at Cowes since 1990, much of that in the Sigma 33 fleet. Since 1996 Michael and his wife Elisabeth have owned S.B. Lady Daphne, see www.lady-daphne.co.uk or call (020) 7562-7656 or email michael_mainelli@zyen.com.